Waller Funeral Home, established by Don and the late Patsy Waller, began operation in December of 1977. At that time, the Wallers dedicated themselves to the principle of "Our Family Serving Your Family" with compassion, commitment, and professionalism through a locally owned and operated funeral home. Hopes for success were high as the chapel was dedicated on December 11, 1977 and spirits were lifted by the wonderful turnout for the dedication. The crowd filled the chapel and overflowed into the hallways. Much thought and preparation had gone into plans for the dedication service and open house. It was an exciting day for all. On May 1, 1983, the Wallers purchased an established Oxford area funeral home. With this purchase, the Wallers were able to employ their daughter and son-in-law, Beth and Bob Rosson. Bob immediately began attending mortuary school and completed his internship under Bobby Phelps, who had been a faithful employee since the beginning of our business. Beth began working alongside Patsy learning the responsibilities of funeral service and funeral home management. Through the years, many improvements and additions to the building, equipment, and surroundings have been made. Major enhancements have included assuming ownership of Eastover Memorial Cemetery in 1987 and constructing a large addition to the funeral home in 1993. Due to health problems, Patsy Waller gave up active daily participation at the funeral home in August 1988. Following her death in 2009, the operation remains in the capable hands of Robert Theron "Bob" Rosson, Jr. CFSP, CPC and Beth who, along with an excellent staff, are continuing her theme of "Our Family Serving Your Family". 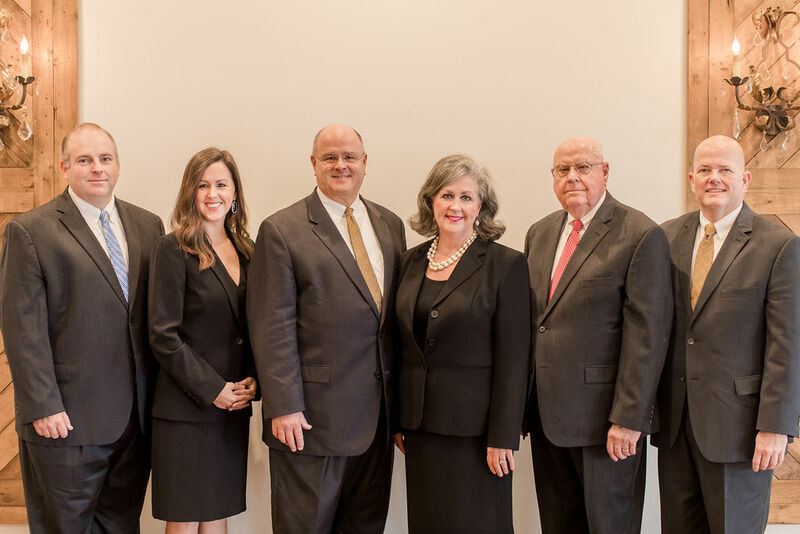 From the beginning, the funeral directors of Waller Funeral Home have been licensed, qualified and well trained. Presently Bob Rosson and Anthony Williams are licensed in all areas of funeral service. Don Waller, Beth Rosson and Sally Kate Rosson Walker are licensed funeral directors. We are also pleased to have Matthew Gardner on staff as a part-time funeral director/embalmer. Additionally, Sally Kate manages the insurance office and our recently completed addition, West Hall. In 2011, both a full-service human crematory and a separate pet crematory were installed on site at Waller Funeral Home and Cremation Services. Presently there are two certified crematory operators dedicated to taking care of your loved ones. Waller Cremation Services continues to grow and evolve as more families select cremation and we are committed to taking care of all of your cremation needs. In 2013, Bob Rosson was elected President of the National Funeral Directors Association (NFDA). Shortly after in the same year, Beth Waller Rosson was elected as the first female President of the Mississippi Funeral Directors Association (MFDA). Remarkably, this was the first time in Association history that spouses both served as president at State and National levels. Bob and Beth place a great importance in giving back to the funeral service profession and believe continuing education along with shared experience allows Waller Funeral Home to adapt to the changing needs of our community. In 2016, a long-standing idea came to fruition with the completion of West Hall. In an effort to provide additional options for families, a 3000 square foot, multi-purpose facility was added to the west side of the building and seamlessly transitions the existing space to a new, more modern space. With a fully functional and state licensed kitchen, West Hall is equipped to offer families an additional option for visitation where food and drink are available or a space to gather for a meal following their services. After opening in July, we were proud to host the cadet graduation reception for the Oxford-Police Department and look forward to using this space to serve Oxford and Lafayette County in many more ways.